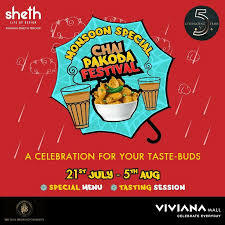 This monsoon, satiate your rainy day hunger pangs at the Viviana Mall’s ‘Chai and Pakoda’ festival from 21st July to 5th August 2018. Participating restaurants have exclusively tailored the menu for the festival that involves quirky dishes like Pani-puri pakoda and Maggi pakoda at Hitchki, Bombay bhajiya at D: OH, Chilli cheese pakoda at Tea trails, etc. to pair with a variety of chai ranging from garama - garam Masala chai to Suleimani.